If you have visited Arlington Arts in the past couple of weeks you may have noticed some of the changes we are starting to implement. If you haven’t, here is everything you have missed and what other updates to the venue you can expect in the coming months. We apologise again for the inconvenience caused by the recent work we’ve had going on downstairs but our toilets are now back in working order! Makeover & A Second Bar! We’re slowly giving the whole venue a makeover so we thought we’d start with the Box Office and the main bar. Already the whole place looks a lot brighter and we’re only just getting started. The Main bar is presented differently now to ensure you can see every option available to you so you can have the night you planned. If you were lucky enough to grab a ticket to see our seasonal opener Reverend Peyton’s Big Damn Band you would have also seen our second bar we have installed in the upper foyer (up the stairs, left of the box office as you enter). This bar will be open at all busy shows to help decrease your queuing time at the main bar, especially in the interval. 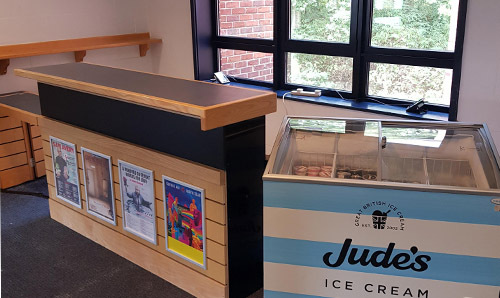 Currently we are only serving Ice Cream and Bottles at this bar as we are waiting on the installation of fridges and beer pumps so keep an eye out for when it’s fully ready! Next post: This Weekend’s Drink Offer.